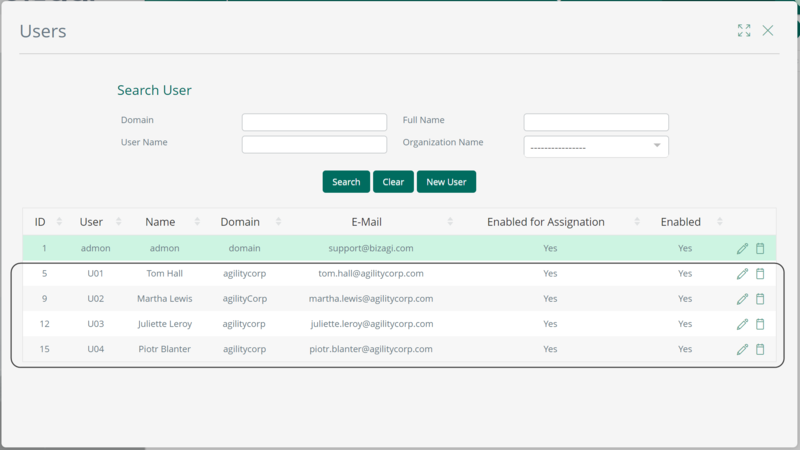 Bizagi supports integration with Identity and Access Management systems (i.e, Identity Managers or Identity Providers) which are SAML 2.0 compliant, such as PingFederate. This section is a guide to the configuration needed, both in PingFederate and in Bizagi, to have an integrated authentication in Bizagi against PingFederate. For SAML 2.0, both your Identity Provider and your Bizagi project must support HTTPS. 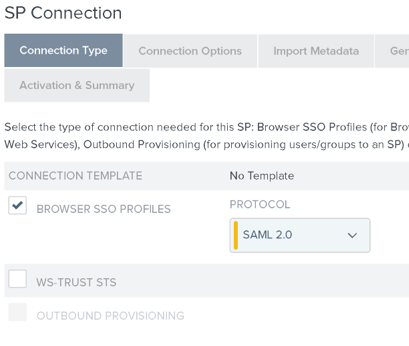 For introductory information about SAML 2.0, refer to Authentication via SAML. 1. To have previously generated and imported your own certificates. The integration uses the for signing assertions. This step is not bound to Bizagi nor restricted by any special requirement of Bizagi (you usually do it yourself). If you need some guidance or an example on this step, refer to Generating and installing certificates. •The certificate information (.p12 file). •The password for that .p12 file, as defined by you at the moment of exporting the public and private key. If you will be encrypting assertions as well, you also need this information for another certificate. You need to be in charge of managing your installed certificates (monitoring expiration dates and any other relevant maintenance work such as responding to changes in your Identity Provider's endpoints). 2. To have already imported and synchronized your users into Bizagi. When integrating any Identity Manager, you need to synchronize user accounts that are authorized to access Bizagi's Work portal. Synchronizing means importing or updating the account's primary identifier only (domain plus username typically, and the email address). Bizagi does not store passwords when integrating an Identity Manager. In Bizagi, unique identifiers for users are either: email, or the combination of domain and username. The examples of SAML-based authentication provided below use email as the unique identifier for users. 3. An installed and fully configured and supported version of PingFederate. Bizagi supports PingFederate version 8. The following example (and official certification) works with version 8.4.3. If you want to use a different version, which supports SAML 2.0, check with our support team. 1. 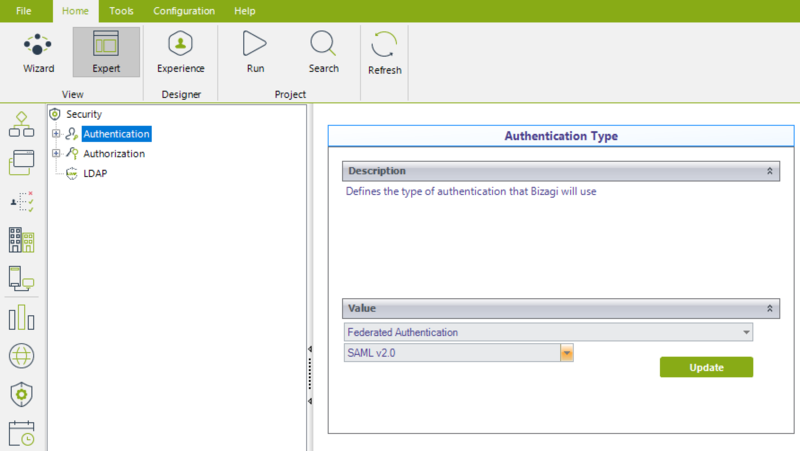 Configure in Bizagi the settings that make reference to the specification of your SAML setup. 2. Configure Bizagi as Service Provider in ADFS. Use the Bizagi Management Console targeting the environment you want this configuration to apply to (e.g, development, testing, or Production environment). Alternatively and only for the Development environment, you can use Bizagi Studio. 1.1. Open the Bizagi Management Console and select your Bizagi project. 1.2. Locate the Security module and select the Authentication option found under the Security item. You will get a confirmation message, Additional parameters appear under the Authentication item. If you applied this change into an environment other than development, make sure to apply the same changes in your Development environment as well. To do this, follow the same procedure using the Bizagi Management Console. 1.3. Configure these additional parameters. Click Update for each parameter you modify. Parameter values are case-sensitive, make sure you provide the correct values. •Cookie type: Define the type of cookie Bizagi uses Persistent o Session cookies. The idle session time-out defines the expiration time for cookies. •Enable assertion encryption: Unselect this checkbox to turn off encryption (set to Off ). At the moment Azure is not supporting encrypted assertions. •Enable authentication logging in database: Check this checkbox (set to On) to direct the web application to log every authentication event, according to your auditing requirements and expectations. You can view the log in the Work portal. •Encryption certificate: Use the Browse button to locate and upload the digital certificate (in P12 format, containing the public and private key) that will be used to encrypt the assertions generated by Bizagi. •Encryption certificate password: Provide the password of the digital certificate used for the encryption of assertions. This password should match the one you defined when you exported certificate information in P12 format. •Force authentication: Check this checkbox (set to On) to disable SSO capabilities so that every time users attempt to log in to Bizagi, they have to provide their credentials. Using this option depends on your authentication requirements and expectations. 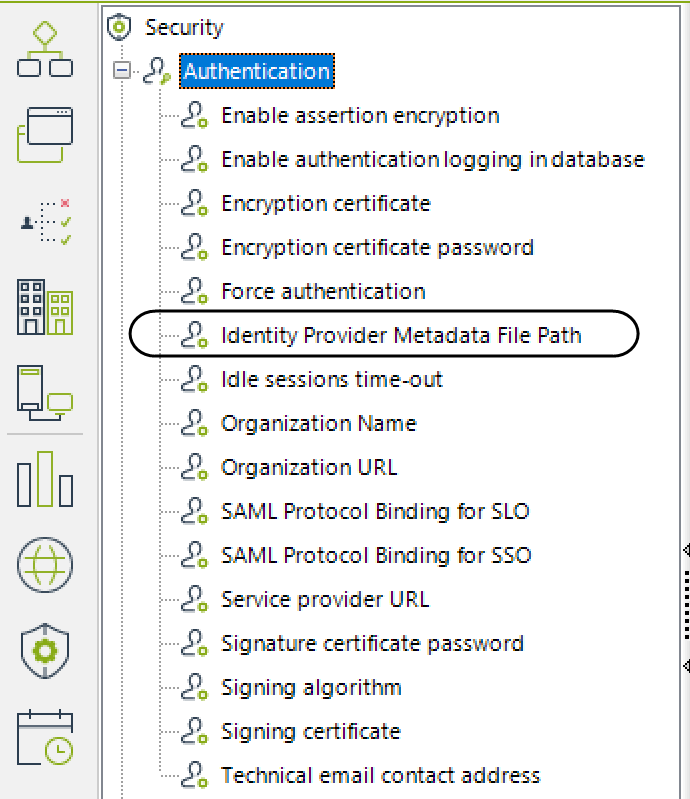 •Identity Provider Metadata File Path: Provide the path where the PingFederate metadata file is located. This location is typically a URL. However, note that configuration of this setting with PingFederate is not done in a single step. PingFederate will not issue its metadata file location before you configure Bizagi as Service Provider. As with Bizagi, you generate a metadata file of settings to use afterward in PingFederate. Leave this setting blank in Bizagi for now, and generate Bizagi's metadata file. 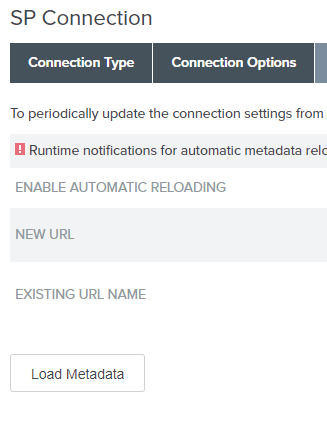 Once you can use Bizagi's metadata file with the configuration in PingFederate, you can obtain PingFederate's metadata URL and come back to this option to fill provide the URL for this setting. •Idle sessions time-out: Define the minutes of inactivity after which a session expires, according to your authentication requirements and expectations (e.g, 5 minutes). •Organization name: Provide the name of your organization. This is included within the request messages sent by Bizagi. •Organization URL: Provide the URL of the website of your organization.This is included within the request messages sent by Bizagi. •Redirect to a logoff page after loggoff process: Check this checkbox if you wish to redirect users to a static logout page when they logout. 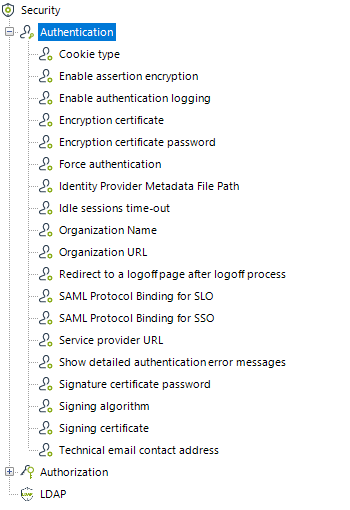 •SAML Protocol Binding for SLO: We recommend selecting REDIRECT as supported specifically by Azure. •SAML Protocol Binding for SSO: We recommend selecting POST so that there is support for longer messages. •Service provider URL: Provide the full URL for the Bizagi Work portal. The above URL is case-sensitive. Do not enter anything for [environment]- to reference the Production environment. •Show detailed authentication error messages: Check this box if you want authentication errors to be shown in a detailed way when they occur. •Signature certificate password: Provide the password of the digital certificate used for the signing of assertions. This password should match the one you defined when exporting certificate information in P12 format. •Signing algorithm: Select either SHA1 or SHA256. •Signing certificate: Use the Browse button to locate and upload the digital certificate (in P12 format), containing the public and private key that will be used to sign the assertions generated by Bizagi. •Technical email contact address: Provide an email address for contact with your corporation regarding technical issues. Once you are done, make sure that your changes have been applied. 1.4. Perform a reset on your Bizagi services. For on-premises projects, this means executing an IISReset. Changes in the authentication type, or any of its settings, are not reflected until the cache of the application server is explicitly refreshed. 1.5. Browse for the location of the metadata file that Bizagi generates based on the configuration. To configure PingFederate more easily, download a metadata file to a local path to use as input in PingFederate. 2.1. Login with admin rights to your PingFederate server. 2.2. 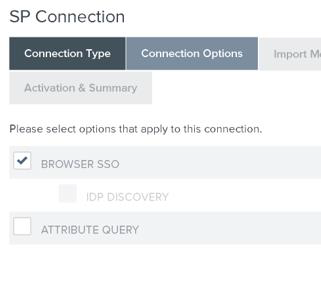 Access the Idp Configuration menu and locate the SP Connections section. 2.5. Use the Load metadata option on the Import metadata tab. Browse for Bizagi's metadata.xml file for further configuration. 2.6. Confirm that Logging mode is set to Standard, on the General info tab. 2.8. Configure the Web browser and HTTP profile for message exchange. First click on Configure Browser SSO. 2.9. 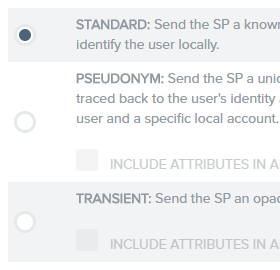 Click the SP-Initiated SSO and the SP-Initiated SLO checkboxes on the SAML Profiles tab. You may accept or modify defaults according to your policies. 2.11. Click Configure Assertion Creation on the Assertion Creation tab define which information the response assertions include. 2.13. Define the attribute taken as the base for the contract, at the Attribute Contract tab. 2.14. 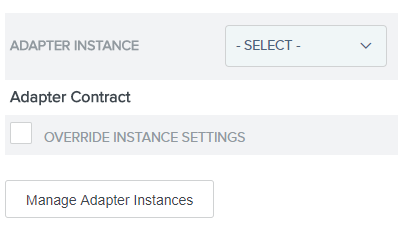 Click Map New Adapter Instance on the Authentication Source Mapping tab. You can create a new one or select an existing one. 2.17. 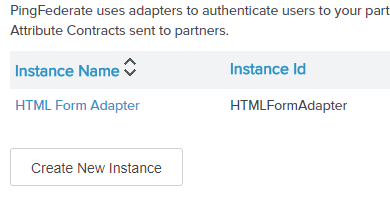 Select Adapter in the first drop-down list (Source) and Mail for the second one (Value), the SAML_SUBJECT fields on the Attribute Contract Fulfillment tab. If the contract was extended in step #2.13 with the Email attribute, you need to select the same options from the drop-down lists (first Adapter, then mail) for the Email field that appears. 2.18. Skip the configuration presented on the Issuance Criteria tab. 2.19. 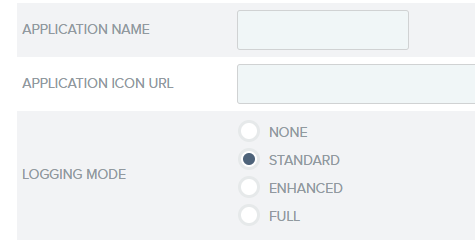 Click Configure Protocol Settings in the Browser SSO section and review Protocol Settings. The following configuration should be automatically filled out based on Bizagi's metadata file. •On the Allowable SAML Bindings tab, only POST and REDIRECT values should be selected. •On the Signature Policy tab, we recommend that you enforce that assertions are always signed and that signatures are required for Authn requests. •On the Encryption Policy tab, make sure The Entire Assertion option is selected for encryption (instead of the Allow Encryption in SLO Messages from the SP option, which is not supported). 2.20. Click Configure Credentials on the Credentials tab and locate the Credentials section, to define security measures for messages between PingFederate and Bizagi. 2.21. Browse in the Digital Signature Settings tab for the certificate to sign assertions that are sent to Bizagi. Select either SHA1 or SHA256 for the algorithm. This setting should match the algorithm defined in Bizagi parameters. 2.22. Define how the certificate will be validated by PingFederate whenever Bizagi signs messages. For this, go to Manage Signature Verification Settings. 2.23. Select UNANCHORED in the Trust Model tab (to support self-signed certificates). 2.24. In the Signature Verfication Certificate tab, select the public key employed by Bizagi for signing purposes. If this key is not selectable in the drop-down list, use the Manage Certificates button to first import it. 2.25. 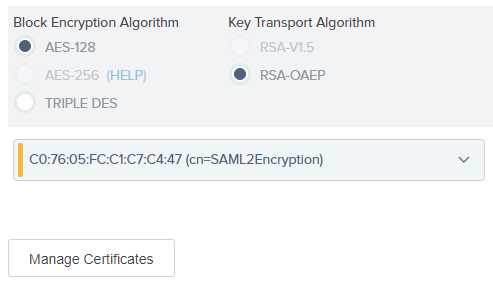 If you have enabled in Bizagi, that assertions will be encrypted, you need to select the certificate and algorithm used for this purpose (and follow this step and # 2.26). For this, move to the Select XML Encryption Certificate tab and browse for the certificate. Select AES-128 as the Block Encryption Algorithm and RSA-OAEP as the Key Transport Algorithm. If your certificate is not listed in the drop-down list, you can import it using the Manage Certificates button. 2.26. Move tto the Select Decryption Keys tab and browse for the certificate Bizagi uses to encrypt messages sent to PingFederate. 2.26. Finally, make sure that the Connection status is set as Active on the Summary page. Make sure your changes are saved and exit when done. When you configured settings in Bizagi, you left the Identity Provider Metadata File Path blank. To complete that setting, you need to obtain PingFederate metadata file. You have configured your PingFederate to rely on SAML 2.0 for an integrated authentication with Bizagi!